Xiaomi also includes in its immense offer many devices in the industry of the sound. To the various headphones and speakers, now we must add Xiaomi Internet Speaker, an audio system connected with several smart functions, and as always, at a very interesting price on paper. In a rectangular design, but with rounded corners, we find two medium and treble range drivers, while to manage the bass there are two woofers of 6.35 cm with the support of a tubular resonance box. To get the best sound from the various transducers, there is an Amlogc 8726M3 chip, true smart core of this Internet Speaker. In addition, it has WiFi connectivity and Bluetooth 4.1 to use from a smartphone, and even with some of the most special features such as alarm clock, personalized sound profiles (selectable from the application MiHome or a specific button), and voice commands (we suspect only in Chinese). It is also equipped with a USB 2.0 port for reading audio files from external drives and 8 GB of internal memory. The speaker can be controlled using the physical buttons on the device itself or through the MiHome app, downloadable from the Google Play Store. Xiaomi, best known for manufacturing a large number of smartphones, this time ventured into a different category, a system connected to several smart functions and with the main task to allow access to more than 1500 radio stations without the need to take a step. 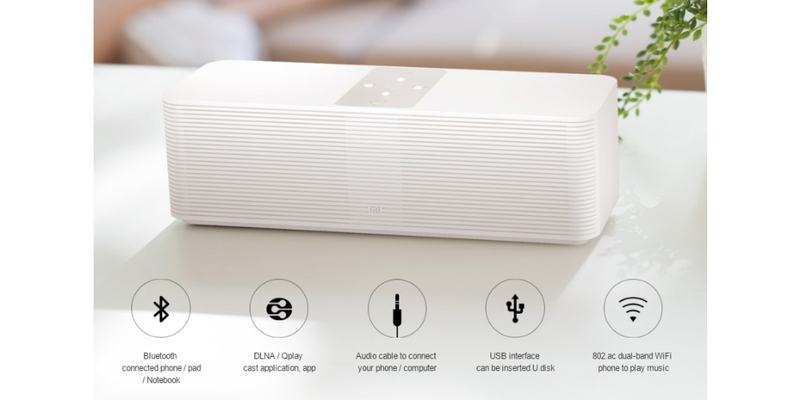 The Xiaomi Internet Speaker will be available on November 25th in China. However, there is a possibility that online stores send orders to the West and that this way is also available to us. In that sense, it remains to be seen if the attractive price of ¥399, about $ 60 to exchange. To see it here may not have to wait a too long, especially if this news is fulfilled, or anyway we will have to buy this smart sound system through some online store in the East.